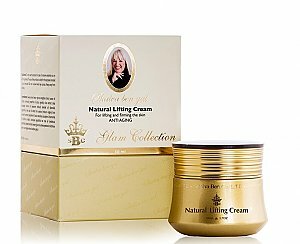 Anti-Aging Face Cream for skin firming, based on Dead Sea natural minerals that delay skin aging. Efficient for lifting the facial skin. Contains natural oils such as wheat germ oil, olive oil and grapeseed oil. Apply an even layer of cream to clean skin and massage the area until absorption. It is recommended to use the cream on a daily basis. Sweet almond water (prunus amigdalus dulcis) castor oil (ricinus communis) grapefruit oil (citrus grandis) olive extract (olea europaea) sesame oil (sesamum indicum) lavender oil (lavandula angustifolia) maris sal oil wheat bran extract (triticum vulgare) bran extract) fragrance (supplement) focus vesiculosus tocopherol chamomile oil (anthemis noblis) achinacea angustifolia tea tree oil (melaleuca alternifolia) cetearyl alcohol cetearyl glucoside phenoxyethanol triethilene glycol water algae extract butylene glycol.